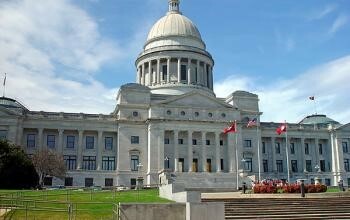 The Arkansas House and Senate education committees met jointly this week and discussed reports of adequacy issues related to special education and ACTAAP. Committee members also heard an update on ForwARd Arkansas. About 12% of K-12 students in Arkansas have a disability that requires special education services at least part of the school day, according to a report by the Bureau of Legislative Research (BLR). Responding to legislators’ concerns about a marked increase in the number of students with autism, ADE spokespersons said public health emphasis on early diagnosis and greater awareness in schools in identifying the condition may account for the rise. The report examines the cost of special education, as well as how Arkansas special education students fare on academic assessment. The legislative task force examining best practices in special education convenes today at 1:00 pm at the state capitol, the first meeting of an 18-month study process (agenda). BLR provided an overview of issues related to the four components of the Arkansas Comprehensive Testing, Assessment, and Accountability Program. The assessment, school rating, improvement planning, and academic distress programs have changed significantly in the last year or are expected to change soon. Committee members expressed concern about the difficulty of comparing Benchmark to PARCC test results and the comparability of ACT Explore and Aspire reports. BLR and ADE expect to have more specific information on assessment and academic distress when PARCC results have been analyzed. The ForwARd Arkansas steering committee has completed its assessment of the condition of education in Arkansas and is planning the next phase of “statewide engagement to create a new vision for education.” In reviewing recommendations for each of seven focus areas, Kathy Smith of The Walton Family Foundation and Cory Anderson of the Winthrop Rockefeller Foundation emphasized the importance of communities developing approaches based on their unique strengths and needs. The ForwARd Arkansas report and recommendations are available on their website.